Kitties love to be warm and toasty. They have an unerring instinct to work their way towards the warmest parts of the house and then sleep the day away. Especially when it is cold and wet outside. During the summer they will lie in any sunbeam they can find but in the winter months then they start looking for warmer places. 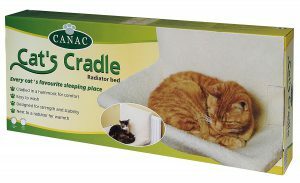 I tried out this cat radiator hammock last winter and it is currently a hit with my kitten (well she is one year old now) – so much so that she has been sleeping in it all summer. Cat radiator hammocks are really very snug. And the Canac cats cradle is no exception. They are also a very simple design so very easy to put together and take apart. You basically have a metal rod which goes around and through the bed area which gives the hammock its shape. This one piece rod is then curved on either end so it can just be hooked around your radiator. Think of it as the framework of the hammock. The bed itself is made from a simulated sheepskin fabric and this is suspended between the rod framework. It is simple to remove the fabric for washing and it is completely machine washable. Putting the fabric back on the rod is also simple – almost like putting a duvet cover on your duvet. And it just takes a couple of minutes to put it all together. As your cat will rest in the fabric area and this is suspended between the metal framework then the hammock will mold itself to your cat’s body. 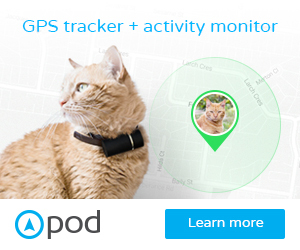 Therefore your cat is suspended off the floor so there is plenty of air circulation around the bed. As it also rests against the radiator then the warmth of the radiator will also warm your cat’s body. 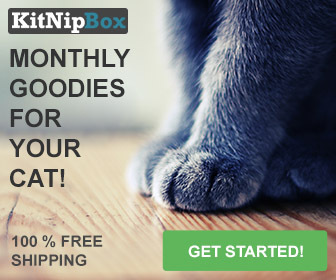 Therefore, your cat will feel lovely and snug and toasty. I did initially wonder if a cat hammock was going to be safe as it looked so simple. But it’s pretty much ragdoll proof. 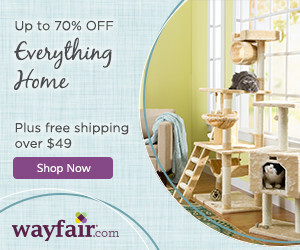 And if anyone knows a ragdoll cat you will know they are very large and heavy cats. 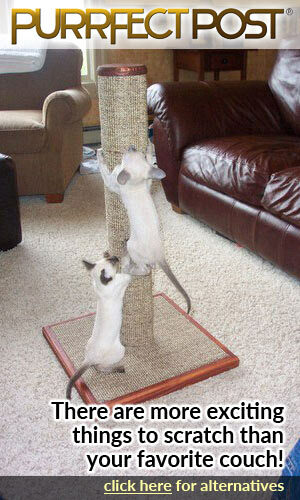 The metal framework stands up to the weight of a cat jumping into it and is also fine for small dogs. Plus the fabric is very sturdy and is simple to keep clean. As you just loop the ends of the framework over the radiator then the radiator itself bears the weight of your cat. Not all radiators though can take the hammock. 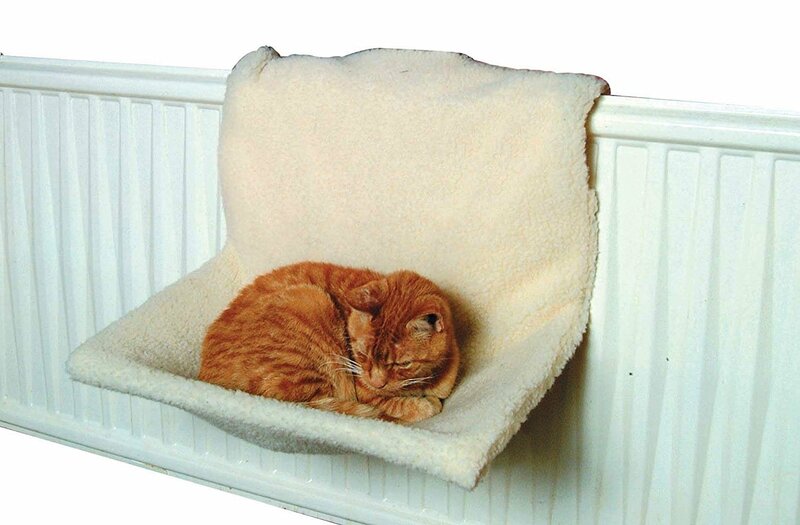 This standard cat radiator hammock fits radiators up to 3 inches in depth. The actual sleeping area is approximately 50 inches wide by 33 inches deep. Callie, the kitten, currently loves this bed more than any other in our house. 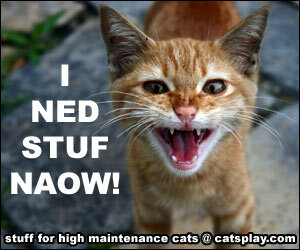 But as you know with cat ownership they can be fickle and will next week like something else. However, she has now been sleeping in it most of last winter and even through the summer (though the radiators are not currently hot). I just think she really likes the comfortable fabric and being off the floor. Because it is so simple I also cannot think of anything to improve the design – it just works as it is. And it is always a paws up for something that is washable. Maybe if I was being really picky then I would like the fleecy bed itself to come in more colors as it just comes in the basic beige color.